Thailand is a real country for the romantic dining. The choices of stunning dishes are endless with unique table settings, and superb views. Imagine you and your beloved one sit in a private room to send sweet sayings to each other, and have dinner with candlelight and enjoying gourmet food. Giving an elegant beachfront dinner on the rocks to admire the beautiful bay, or in a colonial building to get a real-life experience of being a member of the royal family all will arouse a strong feeling of romance. 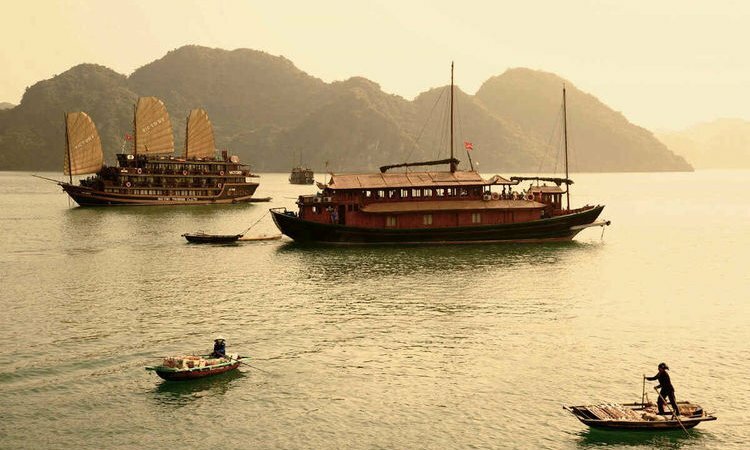 These romantic factors are based on the suggestions from Exotic Voyages travel experts who have 8-year experience in Thailand. If you are trying to wow your partner or simply, enjoy your stable relationship with your spouse, here is the full list of top 10 most romantic restaurants in Thailand that specialize in elegance, intimacy, and of course, fine cuisine! Romantic spots in Bangkok come in many different shapes and sizes. You can have a special and unforgettable night out with your spouse to enjoy the charming rooftop view, or opt for the classic ancient Thai house apart from tasting superb food. The most convincing reason to dine out at Vertigo Grill and Moon Bar is that you two can admire the most breathtaking view in Bangkok. Located on the rooftop of the Banyan Tree Hotel - 61st floor, the restaurant gives you a rewarding experience of taking the whole city view in your own hands. What a romantic dinner with a picturesque backdrop for you to show your mutual love with lights and melodious music. Be aware that the bar is a bit crowded at 9 pm - 10 pm, so we strongly advise you to book a private room in advance or CONTACT US to find a ‘just for two’ corner. Vertigo Grill and Moon Bar are one of the ideal places for having a hot date. Not only the excellent local cuisine, you and your partner will have a chance to travel around the world thanks to the other Asian and European dishes. The grilled seafood, led by the roasted snow fish which is served with butternut squash and capers as well as the appetizer plate featuring seared foie gras, seared scallops, lobster spring rolls, and tuna tartar will get even the greatest critic allured. Aside from the well-known seafood, Vertigo serves luxury dishes, for example, roasted rack of lamb, Wagyu beef. Have a drink at the bar if you come early to feel the romance in the air. 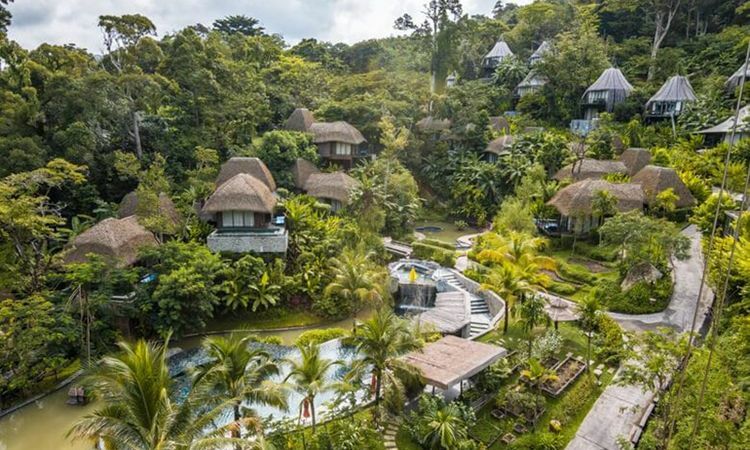 If lots of romance, fine food, and gorgeous surroundings are what you need to have a perfect night that strengthens your special relationship, Issaya Siamese Club is tailored to suit your requirements. The place appears as a flawless oasis to escape the hustle and bustle of the city. A combination of an ancient Thai mansion and an elegant garden with beanbag cushions creates a relaxed and romantic atmosphere. In the evening, the whole area is tinted with golden light for a splendid dining experience like Adam and Eve in the Garden of Eden. 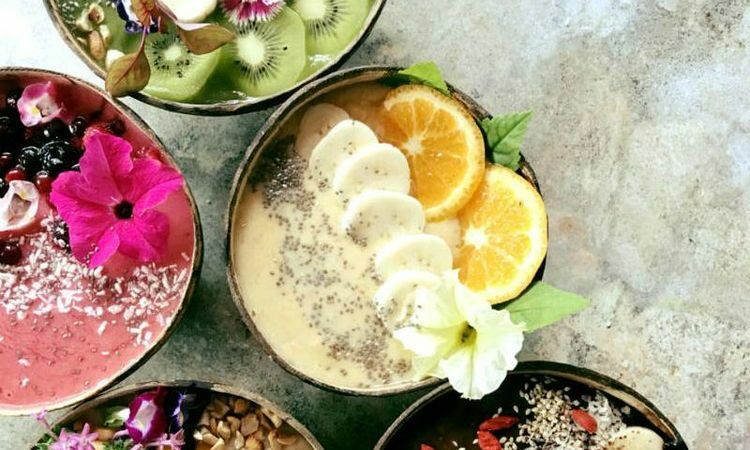 This is a flagship restaurant of the maitre Thai chef - Ian Kittichai which has received many accolades from food critics for organic ingredients and originally wonderful dishes in spite of tourist crowds. It is difficult to choose one as a winner because most of the items are shining stars. However, what a pity if you miss standouts like massaman lamb curry or kradook moo tok covered with baby back ribs. While the new branches have been being established every day, Blue Elephant has still existed as one of the biggest names to enjoy the local cuisine in this country. Until now, it has a dozen of restaurants set up over the world. Your night will be added a touch of luxury and elegance as this is set up in a gorgeous 1990s colonial building, so both of you will turn back the hands of time and enjoy the 20th-century atmosphere like a perfect travel love story. The place itself is very famous for the Thai authentic dishes which uses the exotic ingredients from the Royal Project yard created in the northern mountains. Hence, the combination of excellent food and intimate atmosphere will complete your evening out. Apart from the food quality, its cooking school is also a great point of interest that attracts a large number of visitors who are keen on testing the royal Thai recipes, especially Thai sauces, and curries. What a sweet weekend retreat with your lovely spouse! Attending an afternoon cooking class, and dressing for an intimate dinner like the Royal family with the finest dishes - an experience that only King and Queen of Thailand have. Known as a favorite destination for Northern Thai food lovers that is spicer and richer than other regions in Thailand, Chiang Mai is now an iconic spot for a couple to celebrate their love. 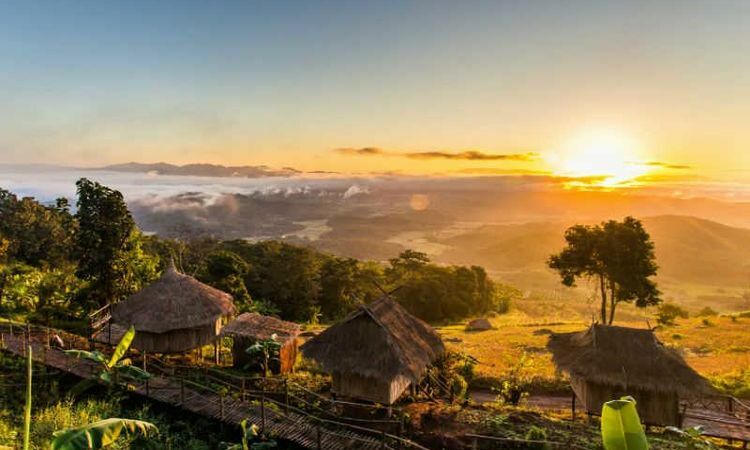 Different from the above-mentioned city life or colonial architecture, this is a mountain town that will give you a good chance to get back to nature, making the romance blossom thanks to the tropical forest, or a spectacular waterfall. There is a wide selection of Thai food, especially the Northern cuisine that earned it a major award. Each dinner plate is made from the freshest ingredients to provide you a sophisticated taste. There is a wide selection of Thai food, especially the Northern cuisine that earned it a major award. Each dinner plate is made from the freshest ingredients to provide you a sophisticated taste. Built on stilts and elevated to the treetops, Huen Huay Keaw restaurant is an amazing spot for a relaxing and romantic meal with your darling partner. The beautiful decorations which are based on the Lanna culture and the spectacular view of an impressive waterfall are just so perfect for you to profess your passionate love. Everything will become much more romantic when the twilight is thickening, and the moon and stars start shining high overhead. For preserving your personal privacy, book room for the couple in advance. Fresh air, gentle wind, nice rock formation, and the distant sound of the nearby waterfall will make you feel peaceful and relaxed while sharing moments with your partner. Nothing is more romantic than wallowing in ana imaginary jungle with waterfalls and trying stunning dishes with your sweetheart. Hidden behind flame trees, centuries-old rain, and sweeping roofs, Le Grand Lanna will impress you with wooden pavilions and Lanna artifacts offering you an ideal venue to enjoy the excellent in the authentic Thai cuisine, particularly the Northern Lanna-style food besides vegetarian-friendly options. Also, the restaurant builds a bridge between different Asian cuisines, both old and modern styles. It is up to you to dine inside on the plush sofas which are elaborately decorated with regional antiques and art, or outside on the terrace overlooking the pretty garden. Likewise, the cultural team will deliver inspired performances of traditional dance and music right at the restaurant. Interestingly, they are often colorful love stories and ancient epics to create a very memorable night. 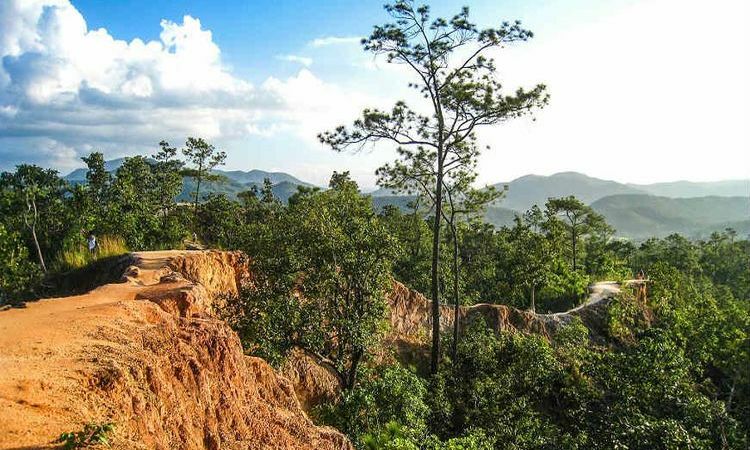 When it comes to Phuket, the name will immediately remind you of a mountainous and rainforested island with the most attractive beaches - a luxurious home to various high-end restaurants, resorts, and spas. The most atmosphere will be completely different from being surrounded by pretty islands. Beachfront dinners or dining on the rocks in the soft breezes and listening to the haunting sound of enormous waves help you escape the typically boring dating. It will be a major loss if you do not visit Mom Tri’s Kitchen - an award-winning restaurant in Phuket which is acclaimed by TripAdvisor gourmet restaurant and Wine Spectator. Beautifully situated on the multi-level terraces, your date will become unforgettable by the breathtaking view of the sandy Kata Noi beach, and the Andaman Sea by the landscaped garden with live music. A simple equation of sea breezes, gorgeous sunset, and jazz at Mom Tri’s Kitchen is everything you need for a romantic moment. The menu here is varied which ranges from the traditional dishes to different fusion creations. A very well-presented Antipasto is an absolute perfection along fresh homemade bread and a nice cup of gazpacho. For the main course, simmered veal cheek in the red wine sauce with roast vegetables and porcini mushrooms will be made lighter by the greatest French rosé. Mom Tri’s Kitchen is a valuable experience like an assault on the senses. Old Siam is an iconic spot for those who love an exotic Thai meal in a tranquil ambiance. Ideally located in the Nakalay Bay on a private beachfront of the opulent and long-standing Thavorn Beach Village & Spa, this is one of a few restaurants at which you can try a tasty Thai royale cuisine with your toes in the soft sand. Of course, the excellent choice would a beachfront dinner so that you can spot the Big Buddha as well as admire the exceptional sundowner. Gazebos and tables are separated by trees with small lanterns that lighten a romantic atmosphere for you and your beloved one. The restaurant is decorated in the old Lanna Style and features three dining areas - indoor, on the beach, and in the courtyard. Its genuine Thai food attractively presents specialties of the four main regions - north, northeast, center, and south to provide you with an unpretentious but classy dinner here will be an affectionate memory that blends in the outstanding location and top-notch food. Khaolak is a series of coastal villages which are renowned for its serene ambiance. Different from other nearby destinations in Thailand, this place is quiet with the family-friendly environment, and secluded resorts surrounded by the coconut palm trees. Thanks to superb options of dining locations, restaurants at The Sarojin are splendid for the oenophiles and gastronomes. Their Ficus and Edge will immediately serve the most stunning contemporary Mediterranean and Thai cuisine with the finest wines. The beach bar gives you spectacular views of the tropical ocean. What an ideal spot to drink cocktails, and for the ultimate dinner, ask for a romantic private setting that might be your private sala, by the candlelit waterfall, or on the white sand beach. 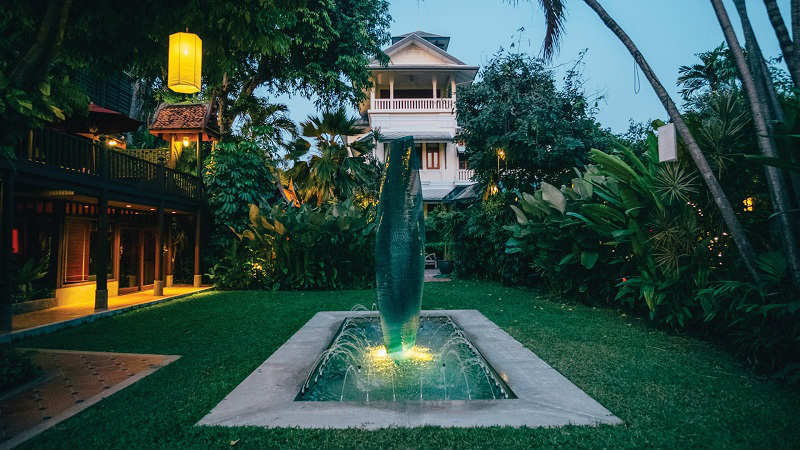 Set in the heart of The Sarojin, the refined and relaxed Ficus is housed under a canopy and hanging roots of ancient trees next to the impressive Lotus Pond. It is time for you to enjoy the contemporary Mediterranean cuisine. Chic, rustic, and breezy are what will remind you of the lovely Edge coming with gorgeous sea views. Your romantic date will be complete by the Southeast Asian dishes and shades of surrounding trees or the open timber pavilion. None of your vacations or honeymoon with your spouse would be successful if you did not try one luxuriously romantic dinner savoring the delicacies of your dishes and blend in an area of breathtaking beauty. Luckily, Koh Samui is truly a heaven on earth that has a lot of charming dining spots, from an exclusive dinner in the wooden hut to dining on a rooftop terrace overlooking beautiful islands and the Gulf of Siam. What a pity if you skip a romantic retreat with a lively rendezvous at Dining on the Rocks - a star attraction of Six Senses Samui - a unique and high-end resort. As its name suggests, the restaurant is strangely built on the rocks with phenomenal views out over Koh Phangan and the Gulf of Thailand (people often do island hoping tour there). It is famous for the fusion food which comes from organic and sustainable produce to encompass local and international cuisine watching the stunning sunset to see the blue skyline turn into brick red, and then deep purple. That magical moment will complete your heart! Tree Tops Sky Dining is an award-winning restaurant that offers the most romantic option on the island here. As a fine-dining enthusiast, you and your partner can experience a luxurious and unique setting among the treetops. Its dining spaces are connected to each other by the wooden walkways which are tightly roped off. The whole area appears as a stateliness to it with old trees and massive boulders. Aside from the romantic atmosphere, couples will have a chance to appreciate a special menu inspired by Master Chef, Azizskandar Awang, which is a combination of high-quality products to be excellently fused on the plate thanks to his culinary experience. Likewise, your dining experience will go above and beyond with a wide wine list which is fully explained by a Wine Sommelier. The menu is complemented with an extensive wine list which is carefully explained by the in-house Wine Sommelier. Want to take a memorably perfect honeymoon or anniversary trip? 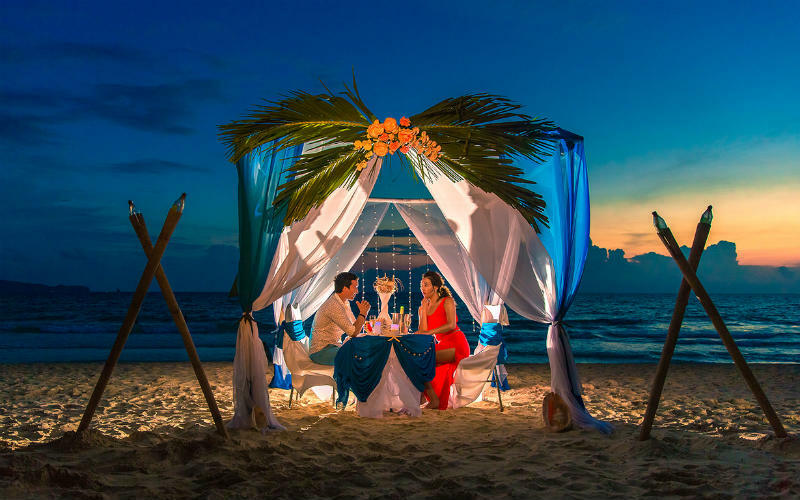 Embark on our Thailand tours to visit these elegant restaurants retaining warm affection towards your spouse, or leave us a comment to share your special experiences with us about your romantic restaurant.